I love a good slaw. Basically, I love any salad that is made from cabbage and crunchy vegetables. Sure, once summer rolls around I’ll be thrilled to dig into a plate of delicate, tender greens. 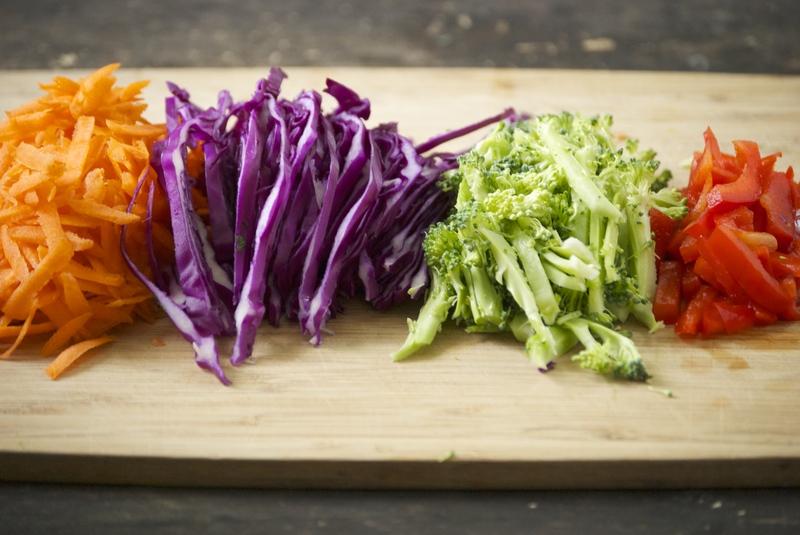 But, in the meantime, I never tire of crunchy, hearty vegetables. They satisfy me when I’m hungry. They have a great mouth-feel– as in, I actually feel like I’m eating something substantial. Like I’m eating a meal. Cabbage (and kale) are really my go-to winter salad fare. Remember this salad? I still eat it at least once a week. The same goes for the one I’m sharing today. 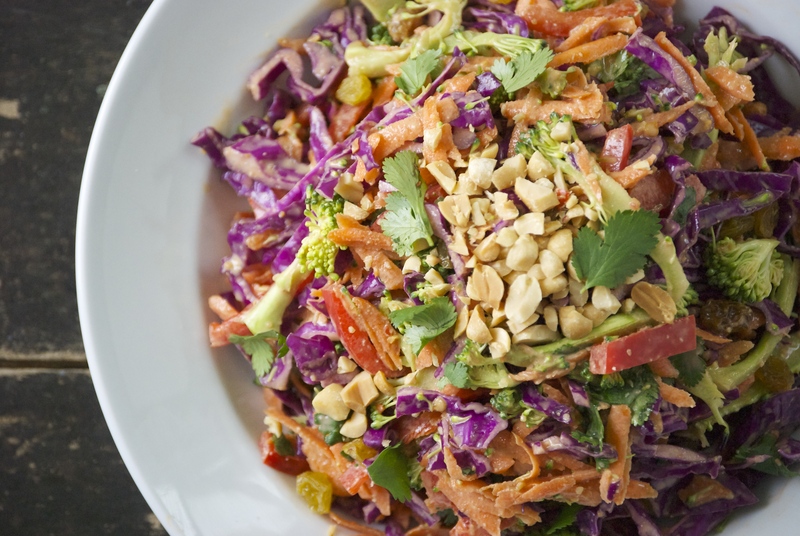 I love combining Asian flavors into a slaw. It just works. Making a dressing using plain yogurt is a perfect way to “health it up”, yet still satisfies that need for something a bit more indulgent and creamy. 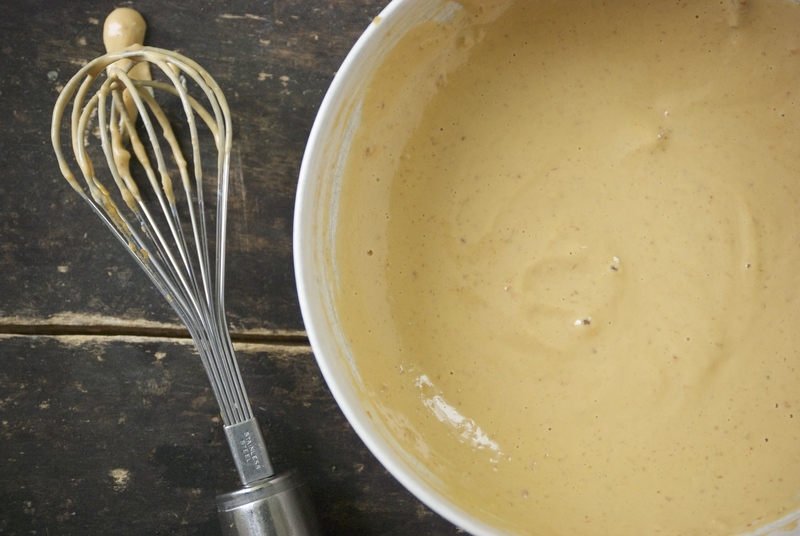 I used freshly ground peanut butter in this dressing, but you can buy good organic peanut butter at your market. Be sure to look for a kind that only contains ground peanuts. Added salt is fine. If you have to use something else with other ingredients, just be warned that the flavor of the dressing may be a bit off, as those other kinds generally contain a lot of sugar. Most of the other ingredients for the dressing are things that you probably have in your refrigerator already. The lime juice is the perfect backdrop for the flavors. 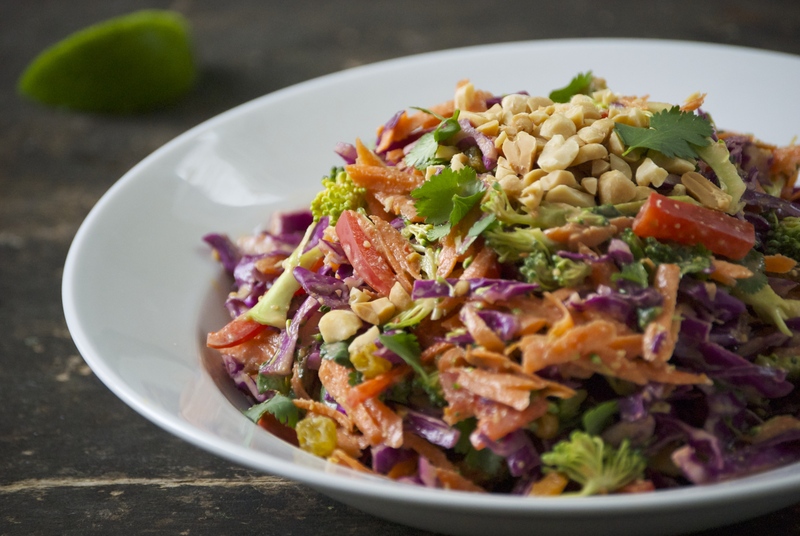 And as for the vegetables, the combination of red cabbage, carrots, carrots, cilantro, and broccoli are wonderful together. I love using broccoli in this finely-sliced form. Broccoli has a wonderful flavor, but I don’t always like chewing on the florets, so this is a nice solution. I’ve also added golden raisins to this slaw. Taking a bite with one in it feels like hitting the lottery. Perhaps I should just toss more in next time?! Cheers– hope you enjoy the slaw! 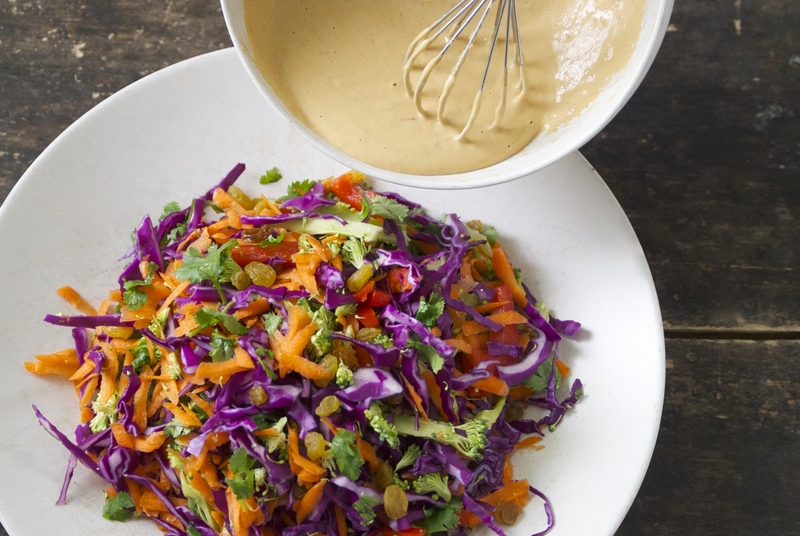 In a medium bowl, whisk the ingredients for the dressing together. Set aside. 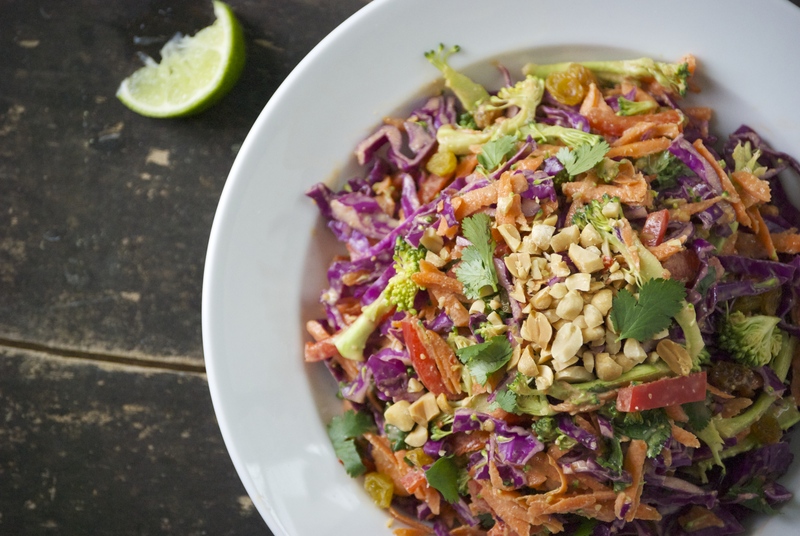 In a larger bowl, combine all the ingredients for the slaw, sans peanuts. Pour the dressing onto the vegetables and mix together using tongs. You may not want to pour all of the dressing on at once (I generally have a bit leftover). It’ll depend on your personal taste. Top with the chopped peanuts or cashews. Enjoy! As always, thanks for stopping by Relishing It today!